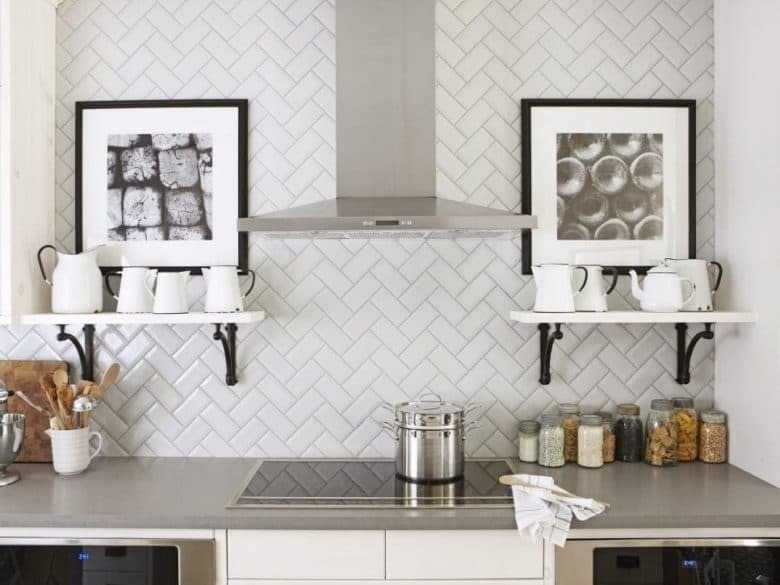 Classic Subway Tile is a big trend that doesn’t seem to be going anywhere. It has a clean look to it that goes with many different decor styles, such as our modern classic mixed bathroom that we are renovating. For our bathroom, we chose a white subway tile that looks like brick for our shower walls. When installing a beveled subway tile, there are some important characteristics that make it a bit different to work with than other tiles. We have been very hard at work renovating the hall bathroom and we have learned a lot along the way. The reveal won’t be for a few weeks but tiling was the biggest project and I am so happy that it is done. Although we have tiled our kitchen backsplash and another bathroom floor, using beveled tile presented new and different challenges for our shower that I wanted to share with anyone wanting to tackle a similar project. When we were deciding our layout for the shower, I decided to create the beveled tiles edging with an endcap piece. One of the biggest problems was that ending with a full piece would result in an uneven looking edge. For a more finished look, layout your design so that the beveled edges are cutoff when butted next to an endcap piece. This is also true when working in corners or if you are ending into a wall. 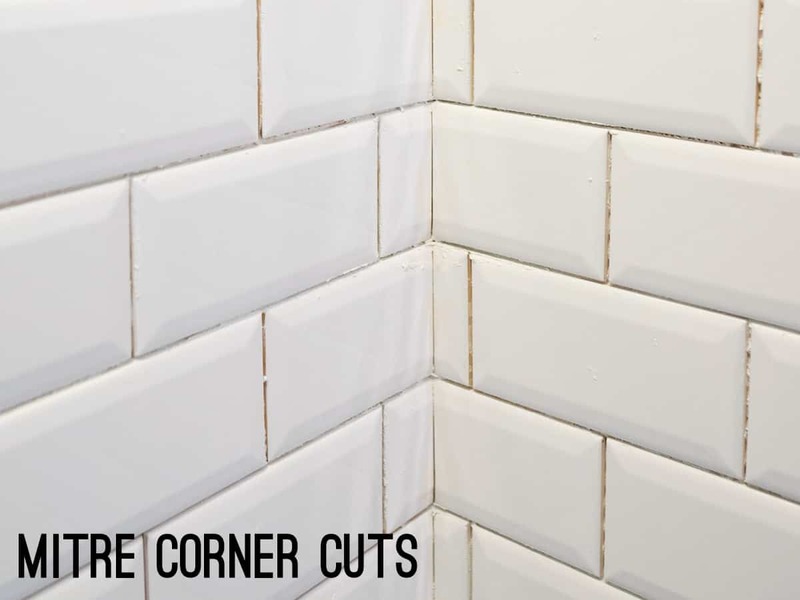 In corners, mitre cuts are an absolute necessity when using beveled edge tiles or really any subways tile that has rounded edges. A mitre cut only means that the cut is done at a 45 degree angle so that both ends connect together to fit a 90 degree angle. 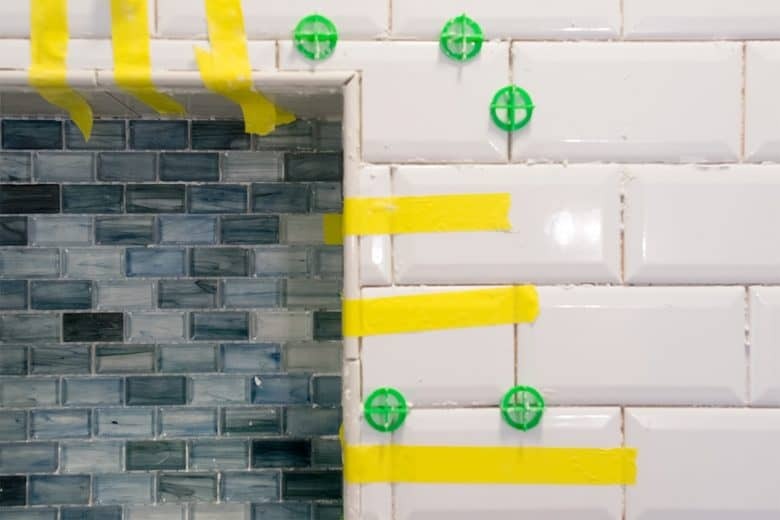 The one thing you will find is that walls in your house may not be perfectly square, or 90 degrees, so you may end up with a tiny gap between the tile. Don’t worry, grout in the corners will cover that up without problem. If you are looking for a tile saw, this one is our recommended Tile Saw (which does mitre cuts). First things first, before you ever put a single tile on the wall, check for level in relation to the other elements in the room. Is the ceiling edge level? 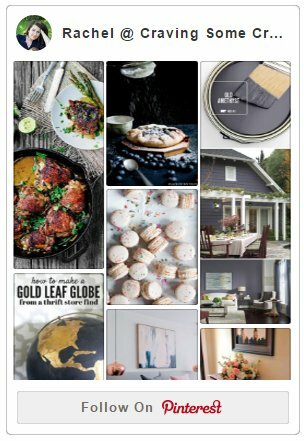 Countertops? Cabinets? etc, etc. Our ceiling bowed in towards the center dramatically, which is why we didn’t tile all the way to the ceiling. We could have built it up with drywall spackle, but decided it wasn’t worth it. When checking for level over long spaces, use at least a 3-4 foot level like this one, not a little level. This tip actually builds on to the last tip. I honestly recommend this tip for most any large tiling surface like a shower or full wall. A ledger board is just any very straight board that you put up where your first tiling row would go. You let the first (or rather second from bottom row) rest on the board when tiling. Using a ledger board will ensure that everything is level and starts out perfect. After you have tiled up the wall, you can remove the ledger board and tile the final row. I forgot to take a picture of ours, but we tacked it up in place of the first row of tile above the tub base. Tile that requires multiple cuts are the hardest to get correct fit. To make this easier cut a piece of paper and fit into the tile space to create a template. After the tile is cut to the shape of the template, dry fit into place to check for fit. With most tile, I recommend using a hard rubber float for grouting around the tiles. However, beveled edge tiles make it difficult for a rubber float to properly push into the grooves, resulting in a lot more wastage of grout mixture. A softer masonry float can be used that will result in less wastage. I personally still used a black rubber float to spread the grout onto the tiles and, then, using my dry fingers, removed the excess back to the bucket. Whichever float you choose, you will still need a tile sponge to even out the grout and create clean professional lines. 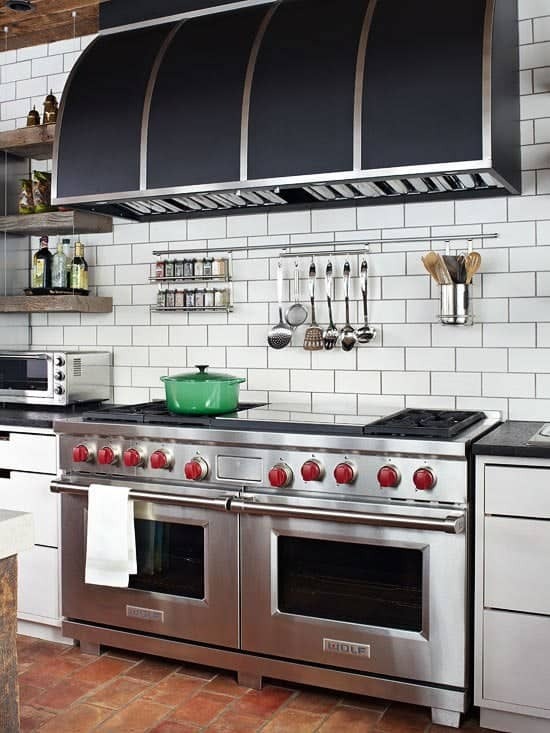 Subway tile is a beautiful option whether you choose beveled edge tile or another option. I admit that I am a very messy tile installer but the look of this tile is so worth the effort of thinking a bit ahead. If you have any questions, let me know in the comments below! Now that the tile is finally finished, we are moving on to the vanity and I have some great ideas coming your way. Update: You Can See Our Completed Bathroom Renovation Here. Did you have any issues with the tile bevels where they meet the mixing valve and valve cover? I’m concerned with water getting behind the valve trim and ultimately in to the wall. When installing the valve cover, we used plumber’s putty on the backside of the valve to seal the wall opening. You can find plumber’s putty here. You shape the putty in a ring on the backside of the cover around the edges, but the putty shouldn’t be visible from the front. I’m about to tile our shower with the same beveled subway tile. When you did the mitre cuts for the corners did you try to leave space for grout or did you try to get them as close as possible? We didn’t leave space so to speak. The corners filled in nicely with grout when we wiped with a sponge. The one problem we did have was the beveled areas (not the raised flat areas). If you wipe them with just a sponge, the grout made a diamond shape where the bevels met. After some trial and error, I found that pulling out excess with a gentle q-tip was the best way we could get the grout to look right, without the diamond shape. There may be other ways of doing it too. Good luck with your project!